February 22, 2016 – This week, we sling-shot around the sun at high warp, sending us tumbling back in time to the Summer of 1832 — and America, at war. It’s not a conflict over land or of arms, but over the fiscal system of the young republic. 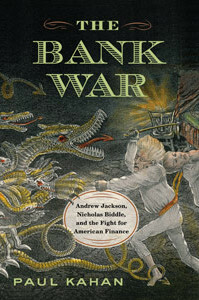 Our guide on this journey is Paul Kahan, and his book is The Bank War: Andrew Jackson, Nicholas Biddle, and the Fight for American Finance . The fight against the Second Bank of the United States may have been the most frustrating fight of President Jackson’s life, since — for once — he couldn’t end things by simply shooting or threatening to shoot his opponent in the face. Dr. Kahan holds a Ph.D. in U.S. history from Temple University, an M.A. in Modern American History & Literature, and B.A.s in history and English. He’s also the author of two books on Philadelphia’s Eastern State Penitentiary, and another titled, The Homestead Strike: Labor, Violence, and American History Critical Moments in American Industry . You can visit him at PaulKahan.com, or follow him on Twitter @Paul_Kahan.